China Eastern Airlines is one of China's “Big 3” air carriers (along with China Southern and Air China) and has its hub in Shanghai's Pudong International Airport. It is the second-largest Chinese carrier in terms of passengers carried and, in 2011, joined the SkyTeam alliance with partners like Delta and Czech Airlines. 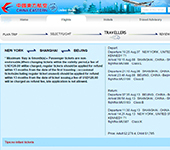 China Eastern is popular among Chinese travelers but has received overall negative reviews from international flyers who note the company's frequent delays and byzantine customer service procedures. 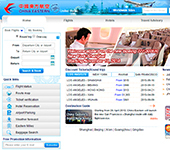 The China Eastern website has a variety of country-specific pages and languages (including English) and offers a bare-bones and somewhat tricky-to-use experience. There are, however, clear links on the home page to view one's flight status, see a route map, and see information on the company's Eastern Miles frequent flyer program. Flyers looking to complete an online check-in should go through the “Ticket Verification” procedure first before completing their check in. 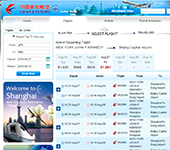 The China Eastern website does include information on the company's baggage allowance policy, though it is somewhat hidden. Currently, China Eastern Airlines offers economy flyers a free checked baggage allowance of up to 20 kilograms. China Eastern Airlines is also popular for its Business Class and First Class sections though unfortunately the website offers no information on the features of these cabins. Where is China Eastern Airlines located?